We have two beautiful and super-creative poster designs by visual designer, Todd Bennings. The poster was inspired by our amazing video, which was designed and produced by motion graphics artist, Rose Pietrovito, of dzinenmotion. Download (save) the 8×10 poster and the 5×7 post card to share with all your friends! 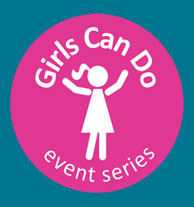 Dear Daughter Studio :: Supporting Girls Can Do With Photo Event! Because She Could, So I can Too! Big News At The White House! TO INSPIRE A GENERATION OF POSSIBILITY THINKERS. 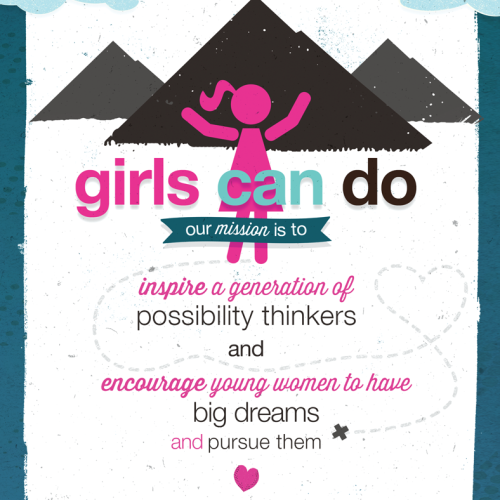 TO ENCOURAGE YOUNG WOMEN TO HAVE BIG DREAMS AND PURSUE THEM. After all, what you want to do in life is always your best option, and anything is possible if you expect it. Girls-Can-Do is a WA State corporation with 501(c)(3) non-profit status | Photo of home page girls by Mark Gsellman | GCD Video by dZinenmOtion.